Email us a writeup of your Lufthansa flight and we'll give you a travel voucher to discount the price of your next one! Free assistance is just a click away - and we are itching to help you! It's a misconception that Lufthansa only flies to Germany/Europe! There are regular Lufthansa flight offers regular flight specials from South Africa to Europe indeed, but also to the United States (from Johannesburg & Cape Town). *Note that specials run out in a matter of hours and sometimes minutes, as there's very limited availability on selected flights only, and even if it's the morning of the date of the special, airfares may have changed from those listed below. Terms and conditions apply (subscribe to our newsletter to be updated of flight specials). Book at Lufthansa. 2015-07-07: Lufthansa's Go West Special features some great flight deals to the USA! Flights from Johannesburg to Miami from R13,325*, Washington from R13,025* and Boston from R13,025*. Prices are subject to change and are only valid for three days. No longer valid - retained for historic reference purposes only. 2015-06-23: Lufthansa's currently running a European special. Johannesburg to Rome from R5,860*, Johannesburg to Lisbon from R7498* and Johannesburg to Dublin from R6210*. Prices are subject to change and are only valid for three days. 2015-06-09: Lufthansa has just launched a special to Italy! Amazing flight prices include Johannesburg to Milan from R6260*. Johannesburg to Rome from R5,860* and Johannesburg to Venice from R6260*. Prices are subject to change. Only valid for three days. 2015-06-03: Lufthansa is currently running an amazing special to their Eiropean destinations. They are currently offering flights from Johannesburg to Dublin from R6,210*, Johannesburg to Barcelona from R6,677* and Johannesburg to Brussels from R6,830*. *Prices are subject to change. Only valid for three days. 2015-05-26: Lufthansa is currently running an amazing special to most of their destinations. They are currently offering flights from Johannesburg to Berlin from R6,789*, Johannesburg to Brussels from R6,830* and Johannesburg to Dublin from R6,210*. *Prices are subject to change. Only valid for three days. 2015-05-19: Lufthansa's "Germany Flight Special". You can now fly to Berlin from R6,790*, Munich from R6,880*, Hamburg from R7,230* and Stuttgart from R8,080*. *Prices are subject to change. Only valid for three days. 2015-05-12: Lufthansa's "USA Flight Special". You can now fly to Chicago for R13,460*, Miami for R13,460* and New York for R13,160*. *Prices are subject to change. Only valid for three days. 2015-05-05: Lufthansa's "Flights to big world cities" special. You can now fly to Amsterdam for R7,700*, Rome for R6,440* and Munich for R6,950*. *Prices are subject to change. Only valid for three days. Travel dates between 24 Dec - 20 Jun and 16 Jul - 11 Dec.
2015-03-24: Lufthansa's "25% Off 25 Premium Economy Destinations" special. You can now fly to London for R17,200*, Prague for R14,200* and Dublin for R14,200*. Book before the end of the month. For travel before the end of July 2015. *Prices are subject to change. 2015-02-17: Lufthansa's "Discover Europe's Finest" special. You can now fly to Amsterdam for R7,700*, Barcelona for R6,710* and Munich for R6,950*. Valid for three days only. Block out dates may apply. *Prices are subject to change. 2015-02-13: Lufthansa are offering a two-for-one business class ticket special. You can now fly to Hamburg for R38,000*, Lisbon for R36,800* and Warsaw for R36,800*. Book before midnight on the 14th of February 2015 for flights from the 15 June to the 31st of August. *Prices are subject to change. 2015-01-30: Get up to 25% off your next premium economy flight before the 31st of July 2015. Book and pay before the 8th of February 2015. Flights from Johannesburg to Barcelona from R14 150*, Berlin from R14 690*, Brussels from R14 270* and Frankfurt R14 330*. *Prices are subject to change. 2015-01-23: Get your up to R550 Lufthansa voucher and save on your next flight! Claim your voucher here. Flights to Barcelona from R7010*, Dublin R6390* and Milan R6760*. *Prices are subject to change and there is very limited availability. 2014-12-12: Lufthansa "Airfare Highlights" Special; Johannesburg to Brussels from R6720*, Johannesburg to Paris from R6790*, Johannesburg to Cologne from R7130* and Johannesburg to Lisbon from R6500*. *Prices are subject to change and there is very limited availability. 2014-11-21: Lufthansa "Europe is always a good idea" Special; Johannesburg to Barcelona from R5,882*, Johannesburg to Florence from R5,861*, Johannesburg to Milan from R5,954* and Johannesburg to Warsaw from R5,805*. *Prices are subject to change and there is very limited availability. 2014-10-31: Lufthansa "Walk a Path You've Yet to Take" Special; Johannesburg to Paris from R7,390*, Johannesburg to Berlin from R7,480*, Johannesburg to Rome from R7,020* and Johannesburg to Vienna from R7,490*. *Prices are subject to change and there is very limited availability. 2014-10-24: Lufthansa "Downtowns and Main Streets" Special; Johannesburg to New York from R13,150*, Johannesburg to Boston from R13,150*, Johannesburg to Philadelphia from R13,150* and Johannesburg to Washington from R13,150*. *Prices are subject to change and there is very limited availability. 2014-10-17: Fly Lufthansa from Johannesburg to Cologne from R8,100*, Johannesburg to Porto from R7,800* and Johannesburg to Barcelona from R6,920*. *Prices are always subject to change. Limited availability. 2014-10-10: Lufthansa "Cape Town ✈ Munich ✈ Beyond". Fly CPT to Munich from R7,330*, CPT to Barcelona from R7,200* and CPT to Lisbon from R7,210*. *Prices are always subject to change. Limited availability. 2014-10-03: Lufthansa "Double the Luxury Sale. Two for one Business Class Special, buy one business class ticket and get one free. Fly JHB to Munich from R40,100* per couple, JHB to Paris from R40,310* and JHB to Vienna from R38,760*. *Prices are always subject to change. Limited availability. 2014-09-19: Lufthansa currently offer great specials from South Africa. Fly JHB to Munich from R7670*, JHB to Porto from R7690* and JHB to Vienna from R7580*. *Prices subject to change. Limited availability. On selected dates only. 2014-09-05: Two for one business class special - JNB to Paris from R40,090*, JNB to Amsterdam from R38,830* and R38,520* from JNB to Barcelona per couple. 2014-08-29: From 2 October 2014 Lufthansa will be flying direct from Frankfurt to Marrakesh from as little as R7,740*. They will be departing on Thursday and Sundays. *Prices subject to change. Limited availability. On selected dates only. 2014-07-21: "Lively cities" flight sale: JNB to Madrid from R6750*, JNB to Florence from R7700*, JNB to Paris from R7390. *Prices are subject to change. 2014-07-07: "German Delicacies" flight sale: JNB to Berlin from R7,500*, JNB to Frankfurt from R7,900*, JNB to Hamburg from R7,420*, JNB to Munich from R7,580*. *Prices are subject to change. 2014-07-31: "The Glorious and The Hearty" flight sale: JNB to Athens from R7,290*, JNB to Barcelona from R6,970*, JNB to Dublin from R6,840*, JNB to Stockholm from R6,940*. *Prices are subject to change. 2014-07-25: "Italian Destinations and Sensations" flight sale: JNB to Milan from R7,239*, JNB to Florence from R7,869*, JNB to Rome from R7,349*, JNB to Venice from R7,656*. *Prices are subject to change. 2014-07-18: "Take on Europe" flight sale: JNB to Munich from R7,869*, JNB to Brussels from R7,869*, JNB to Copenhagen from R7,290*, JNB to Vienna from R7,869*. *Prices are subject to change. 2014-06-14: "From all angles" flight sale: JNB to Barcelona R7,090*, JNB to Istanbul from R7,030*, JNB to Lisbon from R7,560*, JNB to Athens from R7,400*. *Prices are subject to change. 2014-05-08: "On top of the world" flight sale: JNB to Stockholm from R7900*, JNB to Amsterdam from R8100*, JNB to Berlin from R8600*, JNB to Copenhagen from R8000*. *Prices are subject to change. 2014-04-30: "Sun, Sea and a Sanctuary of your own" flight sale: JNB to Madrid from R7020*, JNB to Milan from R7100*, JNB to Rome from R7140*, JNB to Lisbon from R7500*, JNB to Porto from R7700*. *Prices are subject to change. 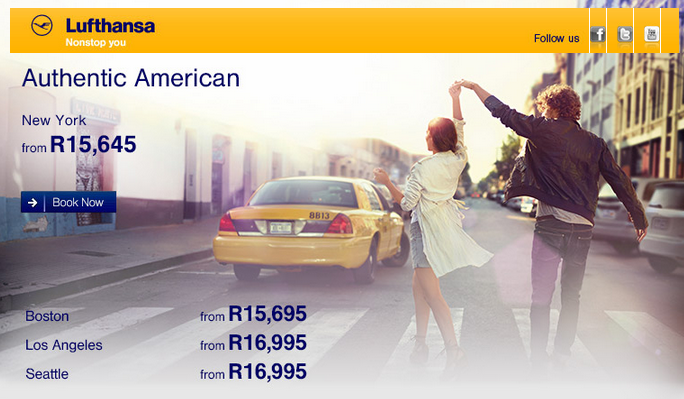 2014-04-16: Lufthansa's "American" flight special: JNB to New York from R10200*, JNB to Washington D.C from R10700*, JNB to Miami R11000*, JNB to Los Angeles from R11200*. *Prices may change. 2014-04-23: Lufthansa's "Eastern European Highlights" flight special: JNB to Moscow from R7620*, JNB to Kiev from R8315*, JNB to Bucharest from R8400*, JNB to Budapest from R8500*. *Prices may change. 2014-04-09: Lufthansa's "Amazing Europe" flight special: JNB to Athens from R7830*, JNB to Barcelona from R7500*, JNB to R7850* JNB to Frankfurt from R8610*. *Prices may change. 2014-03-27: Lufthansa Business Class flight special: JNB to Madrid from R24,850*, JNB to Amsterdam from R25,200*, JNB to London from R28,200*, JNB to Paris from R25,700*. *Prices are subject to change. Book by midnight on Friday the 28th of March 2014. 2014-03-19: Lufthansa's "Chocolate hunt" flight special: Business class flights from JNB - Brussels from R32,300*, JNB - Munich from R32,900*, JNB - Vienna from R32,800*, JNB - Turin from R32,150*. *Prices are subject to change. 2014-03-06: Lufthansa's "Eat your way around the world" flight special: JNB - Barcelona from R7,300*, JNB - Hamburg from R7,850*, JNB - Rome from R7,450*, JNB - Warsaw from R7,230*. *Prices are subject to change. 2014-03-06: Lufthansa's "Best of Britain" flight special: JNB - Birmingham from R9,120*, JNB - Dublin from R7,510*, JNB - London from R9,430*, JNB - Manchester from R19,160*. *Prices are subject to change. 2014-02-28 Lufthansa's "High Five for the USA" flight special: JNB - Boston from R10,800*, JNB - Chicago from R11,800*, JNB - Miami from R11,800*, JNB - Washington from R10,800*. Book before midnight on the 28th of February 2014. *Prices are subject to change. 2014-02-20 >Lufthansa's "Amazing Europe" flight special: JNB - Amsterdam from R7790*, JNB - Brussels from R7750*, JNB - Cologne from R7840*, JNB - Barcelona from R7620*. *Prices are subject to change. 2014-02-05 Lufthansa's "Business class" promotion: Business class flights from JNB - Copenhagen from R40,290*, JNB - Lisbon from R40,140*, JNB - Amsterdam from R40,400*, JNB - Hamburg from R40,780*. *These prices are subject to change. 2014-01-31 Lufthansa's "Run the World" promotion: JNB - Athens from R7,730*, JNB - Barcelona from R7,390*, JNB - Paris from R7,590*, JNB - London from R9,130*. *These prices are subject to change. 2014-01-22 Lufthansa's "From the East Coast, to the West Coast" promotion (where they mean across the United States): JNB - Toronto from R10,468*, JNB - New York from R12,505*, JNB - Chicago from R12,805*, JNB - Washington D.C from R12,505*. *Limited availability, prices may change. 2013-12-12 Lufthansa's "Europe's Most Popular" promotion: JNB - Barcelona from R7,745*, JNB - Cologne from R7,845*, JNB - Copenhagen from R7,785*, JNB - Athens from R8,045*, JNB - Krakow from R8,340*. *Very limited availability, prices may change. 2013-02-12 Lufthansa's "Winter in Winter Wonderland" promotion: JNB - Barcelona from R8,445*, JNB - Dublin from R8,365*, JNB - Brussels from R8,565*, JNB - Frankfurt from R8,230*, JNB - Prague from R8,460*. *Very limited availability, prices may change. 2013-29-11 Lufthansa's "Our business is no joke" promotion: Business class flights from JNB - Berlin from R28,945*, JNB - Moscow from R25,200*, JNB - Madrid from R28,350*, JNB - Prague from R25,095*. *Prices may change. Book by the 30th of November 2013. 2013-20-11 Lufthansa's "Festive Fun " special: JNB to Frankfurt from R8,230*, JNB to Dublin from R8,365*, JNB to Krakow from R8,320* & JNB to Brussels from R7,430*. *Prices are subject to change. 2013-13-11 Lufthansa are offering up to R500 off of mobile flight bookings. Visit theLufthansa mobile portaland complete the entry form to qualify for this voucher. Terms and conditions: The voucher may be redeemed between the 13th of November 2013 and the 13th of December 2013. Vouchers are only valid for flights that are operated by Lufthansa and Lufthansa Regional Partners. The voucher is only valid for intercontinental flights that depart from South Africa. 2013-06-11 Lufthansa's "Inspire a holiday " special: JNB to Paris from from R7,650*, JNB to Porto from R7,350*, JNB to Warsaw from R7,320* & JNB to Prague from R7,430*. Special ends on Friday the 8th of November 2013. 2013-10-30 Lufthansa's "Fly to Europe" special: JNB to Barcelona from R7,390*, JNB to Brussels from R7,510*, JNB to Warsaw from R7,320* & JNB to Frankfurt from R7,410*. 2013-10-16 Lufthansa's "America: it's always worth discovering" special: JNB to New York from R11,055*, JNB to Chicago from R13,410*, JNB to Miami from R13,410* & JNB to Boston from R11,770*. 2013-10-09 Lufthansa's "Desired Destinations" special: JNB to Berlin from R7,945*, JNB to Barcelona from R8,280*, JNB to Dublin from R8,250* & JNB to Brussels from R8,400*. 2013-10-02 Lufthansa's "Business Class Dream" special: JNB to Stockholm from R19,955*, JNB to Milan from R20,295, JNB to Paris from R20,895* & JNB to Warsaw from R20,145*. Travel on selected flights from 15 December 2013 to 12 January 2014. 2013-09-27 Lufthansa's "Book it. Dream it. Live it." offer: Joburg to Krakow from R7350*, Joburg to Berlin from R7945*, Joburg to Moscow from R7575*, Joburg to Prague from R7495* & Joburg to Vienna from R8005*. Available for travel on selected flights from 28 Oct to 31 March 2014. 2013-09-18 Lufthansa's "London to Leprechauns" flight special: OR Tambo to Aberdeen from R8799*, Johannesburg to Barcelona from R8255* & Johannesburg to Birmingham from R9495* & Johannesburg to Dublin from R7399*, OR Tambo to Frankfurt from R7795* and OR Tambo to London from R8745*. 2013-09-13 Lufthansa's "Max Indulgence" special: Johannesburg to Amsterdam from R72,195*, Johannesburg to Berlin from R72,195* & Johannesburg to Munich from R72,695* & Johannesburg to Rome from R72,195*. Lufthansa First Class. 2013-09-04 Lufthansa's "Oktoberfest Delight" special: JNB to Munich from R9,595*, JNB to Berlin from R9,500* & JNB to Frankfurt from R8,195*. 2013-08-30 Lufthansa's "High Five Friday" special: Johannesburg to Rome from R7,445*, Johannesburg to Barcelona from R7,645*, Johannesburg to Istanbul from R7,595* & Johannesburg to Lisbon from R7,545*. 2013-08-21 Lufthansa's "Authentic American" special for flights to the USA : JHB to New York from R15,645*, JHB to Boston from R15,695*, JHB to Los Angeles from R16,995* & JHB to Seattle from R16,995*. 2013-08-14 Lufthansa's "Height of Comfort" Business Class Special. OR Tambo to Milan from R28,545*, OR Tambo to Madrid from R28,795*, OR Tambo to Munich from R29,345* & OR Tambo to Paris from R29,195*. 2013-08-02 Lufthansa's "Take on Europe in 72 hours" special. JNB to Bilbao from R7000*, JNB to Prague from R7195*, JNB to Sofia from R7,095*. 2013-07-26 Lufthansa's "Embrace Europe" flight special. Joburg to Prague from R7795*, Joburg to Sofia from R7695*, Joburg to Bucharest from R7795, Joburg to Zagreb from R8595* & Joburg to Stockholm from R8495*. 2013-07-05 Lufthansa's Europe "Spoilt for Choice" special. Jozi to Amsterdam from R8195, Jozi to Athens from R8295, Jozi to Barcelona from R7995, Jozi to Budapest from R8095, Jozi to Frankfurt from R7795, Jozi to Istanbul from R7995, Jozi to London from R9595, Jozi to Malta from R7995, Jozi to Nice from R8095, Jozi to Stockholm from R8395, Jozi to Vienna from R8495 and Jozi to Zagreb from R8695. 2013-06-28 Treat yourself to business class luxury on your next flight to Europe: Joburg to Frankfurt from R30,695*, Joburg to Lisbon from R31,595*, Joburg to Warsaw from R31,595* or Joburg to Munich from R32,295*. Only on selected flights up to the 25th September 2013. 2013-06-21 Unique destinations offer. JNB to Budapest from R7995*, JNB to Malaga from R7895*, JNB to Malta from R7995* or JNB to Nice from R7995*. 31 May 2013. Shopping & sightseeing special: OR Tambo to Milan from R7580*, OR Tambo to Barcelona from R7700*, OR Tambo to Brussels from R7850*, OR Tambo to Istanbul from R7750* & OR Tambo to Paris from R7900*. 17 May 2013: Lufthansa famous North American cities special: JHB to New York from R13600*, JHB to San Francisco from R14900*, JHB to Toronto from R11750*, JHB to Washington from R13600*. All prices shown are return fares including taxes, fees and charges. In the respective classes seat availability is limited. The total price is subject to availability and your actual routing. 3 May 2013: "Travel in Comfort Business Class Offers". Jozi to Frankfurt from R36300*, Jozi to Lisbon from R37000*, Jozi to London from R39650* & Jozi to Paris from R37700*. 26 April 2013: "High Five Friday" JNB to Bilbao from R6950*, JNB to Aberdeen from R8,250*, JNB to Bergen from R7500*, JNB to Dublin from R7000*, JNB to Vienna from R7550* * In the respective classes seat availability is limited. The total price is subject to availability and your actual routing. 12 April 2013: Canada & the United States are waiting for you: Johannesburg to Las Vegas from R14900*, Johannesburg to Chicago from R13900*, Johannesburg to Montreal from R11500*, Johannesburg to San Francisco from R14900*. Business class Johannesburg to Brussels from R37200*, Johannesburg to Frankfurt from R36400*, Johannesburg to Rome from R37150*. 5 April 2013: Economy class JHB-Dublin from R7100*, JHB-Frankfurt from R6850*, JHB-Vienna from R7650*. Book Lufthansa first class & travel in style - from R70,300 from Johannesburg to Amsterdam, JHB-Milan from R70150*, JHB-Munich from R70750* & JHB-Paris* from R70750*. 1 March 2013: JNB - Barcelona from R6950*, JNB-Frankfurt from R6750*, JNB - London from R8200*, JNB-Munich from R7500*. 22 February 2013: JNB - Berlin from R7400*, JNB - Frankfurt from R6700*, JNB - Moscow from R7150*, JNB - Vienna from R7500*. Business class prices; JNB-Barcelona from R36950*, JNB - Istanbul from R37000* & JNB - Rome from R36950*.